In third grade, Andreas Warhola suffers a corea, a disease of the nervous system that causes involuntary movements of the extremities. After that, he suffers a complication of a scarlet fever, along with several other diseases. His visits to the doctors and the stays in hospitals caused that he would develop hypochondria and that he would isolate himself. In the periods he was confined to stay in bed, Warhol would draw, listen to radio and collect pictures of movie celebrities. Later in his life, Warhol himself would describe this period as very important in the development of his personality. He then studies commercial art to move from his hometown in Pittsburgh to New York, where he begins with a career as an illustrator in magazines, which secured his way of life. But to say that Warhol “paints” is just not true. For his works, he would use a stencil technique that allowed him to copy a design infinite times once the template was ready. 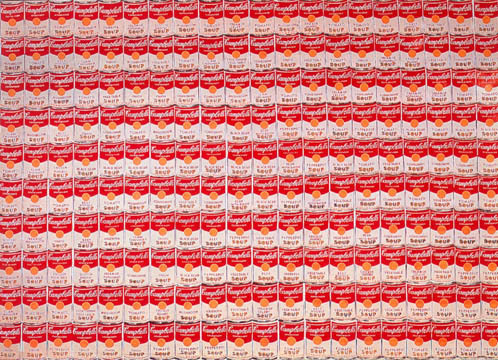 And that’s what we see in 200 soup cans: a repetition of the same design 200 times. Evidently, the content or the technique, in his works, are irrelevant. Or extremely superficial. What interests us is the concept behind: Warhol thinks that the most trivial or vulgar things can be objects of art. Modernity, for him, was full of things he enjoyed every day. Why not to paint about them? He does. And in doing it, he transforms products or personalities into culture icons. But how a simple supermarket product is transformed into an icon? By their universality: Warhol thinks that, in America, the richest consumers buy the same things as the poorest. As he exemplify with the Coke®: both the president of the country and the poorest beggar can enjoy a Coke®. And it doesn’t matter how many things each of them can afford with their money: the Coke® the president enjoys is the exactly same Coke® the beggar can enjoy. Despite he had many detractors, scandalized for “taking at the same level art galleries and supermarkets”, I think what we talked about universality of art is valid: art must be universal, must be for everyone. This way, Warhol changes forever the concept of art appreciation. ~ by Álvaro Mazzino on September 8, 2010.
its ok but i know the truth that this was drawn 5 times and copyed a lot of times that how this was 200 because no one can do that OOOOKKKAAAAY!!! all artist ans they could do better and not copy like u have ok!! This entry was posted on September 8, 2010 at 09:51 and is filed under Pop art.You can follow any responses to this entry through the RSS 2.0 feed.You can leave a response, or trackback from your own site.